A Q&A with Meghan Flynn, ceramic artist and maker of “pique-fleur” vases. I love Meghan Flynn’s vases and was pleased when she agreed to make these unusual “pique-fleur” vases for my shop, Practice Space. I had seen historical examples – they are close relatives of the “tulipier,” a traditionally tower-shaped vase made for holding tulip – and some florists using them in Europe, and thought thata simple, tiny vase made for holding precious, tiny flowers would be so wonderful in the New England spring, when most of the flowers on the ground are too delicate for a traditional vase. The resulting vases are about 4” high, glazed in pink (the color of the moment! ), white, and black. The black creates a high-contrast background that calls attention to the particular beauty of even the most simple and everyday stem, the white and the pink tend to blend well with a froth of colors. The holes allow you to place stems with a great deal of precision, and create arrangements with much more negative space than is possible usually. They are so compact and the patterning made by the holes makes these vases stand alone as objects in arrangements with each other, as well. After spending some time with the vases, I asked Meghan some questions about her process. Q: Tell me about how you developed these particular shapes. What did you try? What made them work? A: I knew I wanted to make simple shapes that curved inward or were completely enclosed at the top. I tried a variety of shapes, ranging from spherical to more traditional vase shapes. I found that forms with a slightly flat top worked best for me for arranging individual stems of buds and flowers. Q: How did you go about arranging the holes in them, in particular? A: I decided to leave a larger hole in the center of most of the vases, surrounded by smaller holes. I arranged the holes fairly symmetrically, but I decided on the arrangement spontaneously with each vase. Q: You told me recently that you have been attracted to vase forms lately. What makes vases interesting to make, as a potter? What makes them challenging? A: Clay is so versatile, there are so many directions I can go with my work. Lately, I have been loving form. Practicing different forms frees up my creativity and allows me to strengthen my skills as a potter. I especially enjoy making vases as they feel like a bridge between functional forms and sculptural work. Q: You have kept some of the pique-fleurs for yourself. What have you learned about your pots from using them, arranging flowers in them? Have you learned anything about flowers? A: It’s important to me that I take some of my pots home, as I learn so much from using them. Everything I make feels different to me once it leaves the context of the studio. With the pique-fleurs I was able to figure out what size holes worked best and what forms I liked. I like that the arrangements can be very spare. Spring is slow to emerge in Maine and the pique-fleurs are great for single stems of buds and blossoms. I have been using them for more than just flowers - tender green leaves, larch branches, and catkins are all beautiful and often overlooked. My appreciation for all of the plants and trees coming back to life has been amplified. as they feel like a bridge between functional forms and sculptural work. Q: This is an unusual kind of vessel. What attracted you to the idea, when I first asked you about them? 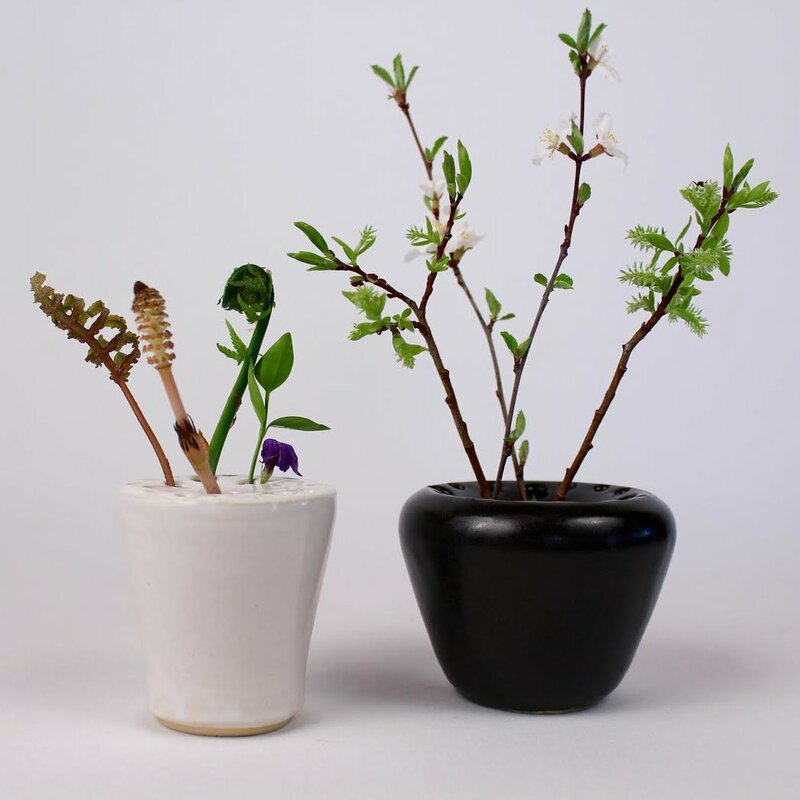 A: I loved the idea of a simple vessel that becomes almost sculptural with the addition of flowers. Each vase has the potential to take on so many forms depending on the mood of the season. Q: What kinds of flowers do you find yourself putting in the vases? where do they come from, how do you find them? do you often play with flowers, or is this new for you? 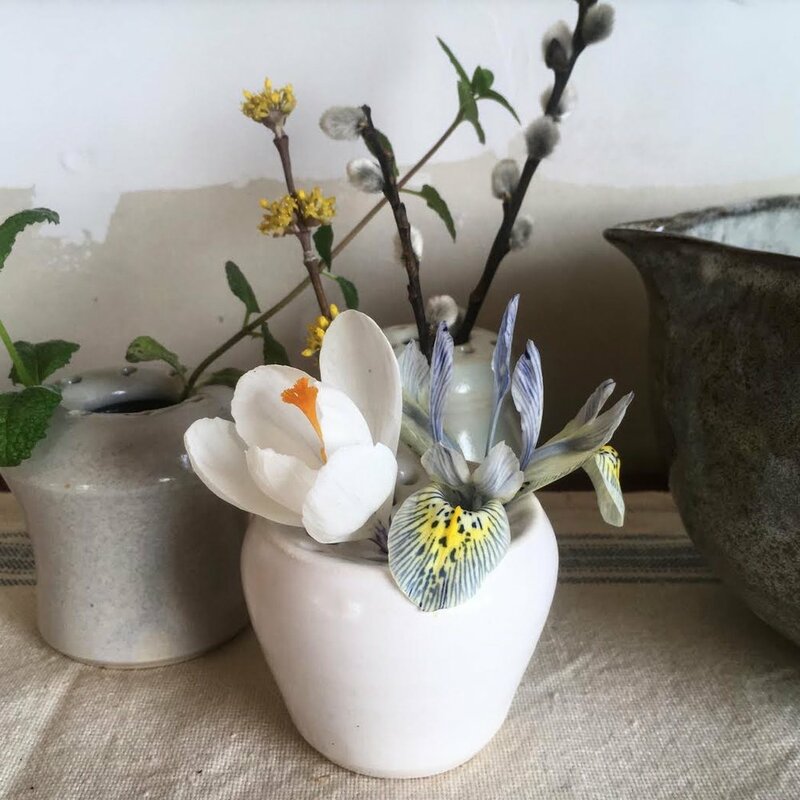 A: Picking and arranging flowers is one of my greatest joys, and I am so happy that it goes hand in hand with making pottery. I pick flowers from my gardens, surrounding woods and fields (in coastal Lincolnville, ME). Every year I find myself enamored with a different kind of flower, and the pique-fleurs are a fun way to showcase the flowers I am most drawn to at any given time.